Gardiner Expressway to Yonge Street north. Turn left on Front Street to bus drop-off zone located on the north side of Front Street immediately west of Yonge Street. Look for signage. The bus drop-off zone is located at 10 Front Street (on the North side) just west of Yonge Street. Please contact the Group Reservations office during business hours regarding bus parking information. 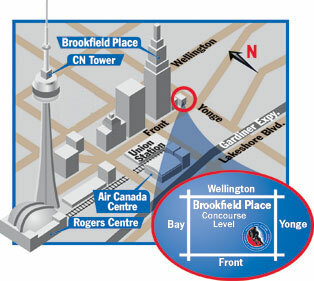 Upon arrival at bus drop-off zone, proceed to Concourse Level of Brookfield Place (formerly BCE Place) and check in at the Hockey Hall of Fame Admission desk. Proceed from the subway station and follow the underground walkway system to Brookfield Place (formerly BCE Place).